Hello fellow puzzlers and PuzzleNationers! It’s Star Wars Day, and what better way to celebrate than with a puzzly Star Wars brain teaser! A fellow Star Wars fan and puzzler sent in this delightful little logic puzzle, and we decided to share it with you! Can you crack this SW gift mystery? Three friends had three kids who were all named after Star Wars characters. 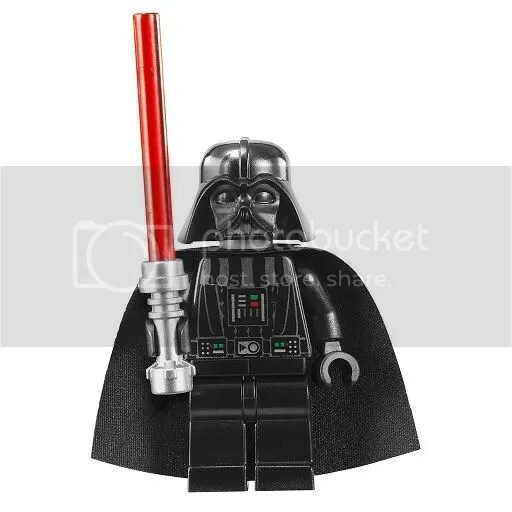 For Star Wars Day one year, all three kids (Han, Leia, and Luke) got different Star Wars LEGO sets as gifts (the Millennium Falcon, an AT-AT, and an Imperial Star Destroyer). Each set had a different number of pieces (1345, 1432, or 1569) and each kid took a different amount of time to complete the model (2, 3, or 4 hours). Using the clues below, can you figure out which kid got which model, how many pieces it had, and how long it took them to build it? 1. The model with the most pieces took the most time to complete, but the model with the least pieces did not take the least amount of time to complete. 2. The models weren’t to scale, so the Millennium Falcon actually had more pieces than the Imperial Star Destroyer, a fact that Luke was upset to learn since he likes bigger models. 3. Han spent the three hours between opening his gifts and lunch building his model. Good luck, fellow puzzlers! Although the puzzle is a bit easier if you’re familiar with the Star Wars Universe, any solver should be able to crack this puzzle with the clues provided! Let us know if you solved it in the comments below! And May the Fourth Be With You! A fellow Star Wars fan found this logic puzzle online and tasked us with solving it. Can you unravel the fiendish Imperial plot? Let’s find out! The Empire came up with a brilliant plan in order to trap various members of the Rebel Alliance: creating a fake Rebel summit. Each Imperial agent involved would invite a Rebel to the summit while posing as one of the Rebels being invited. It would have worked perfectly, except for the fact that Admiral Ozzel posed as the person that he had invited. OOPS. Courtesy of Ozzel’s bumbling, the Rebels were warned ahead of time and armed themselves, hoping to turn the tables on the Empire. Thanks to Han Solo’s timely warning, Luke had hidden his lightsaber and a vibroknife with R2-D2 and C-3PO respectively. These extra weapons allowed the seven Rebel agents of them to escape. It also helped that Admiral Ackbar arrived last in his ship, Home One. Each Rebel arrived in a different spaceship, but two Rebels hitched a ride with fellow agents, so only five spaceships were involved. What vehicle did each Rebel arrive in? Which Imperial invited which Rebel? Who did each Imperial pose as? What weapon did each Rebel carry? 1. Leia, having been warned by Han, carried a concealable Holdout Blaster. She did not arrive in an X-Wing, nor did she fly the Millennium Falcon. 2. Han wouldn’t let anyone fly his baby. Han carried his Heavy Blaster Pistol, ready to shoot the Imperial who invited him while posing as him. This naturally made Han suspicious. 3. When Admiral Ackbar saw who invited him, he put his Force Pike to the Imperial’s throat. He was not invited by Darth Vader, who had posed as R2-D2. 4. C-3PO arrived on the Tantive IV, along with another passenger. This was not the ship Lando used. 5. The Lady Luck was flown by the man invited by Admiral Piett. Its pilot, who traveled alone, carried a Blaster Rifle with him. He gambled a bit, and almost crashed into Luke’s X-Wing. The Imperial who invited him posed as Admiral Ackbar. 6. Grand Moff Tarkin invited Admiral Ackbar. He did not pose as Luke Skywalker, nor did he pose as Leia. 7. General Veers invited R2-D2. Veers posed as R2-D2’s best friend. Captain Needa did not pose as Lando. 8. Leia was led to believe that Luke invited her to the summit. Emperor Palpatine invited Luke while posing as Leia. R2-D2 delivered his weapon to the Rebel so he could keep his father busy long enough for everyone to escape. For today’s Follow-Up Friday post, I thought I’d do a bit of Follow-Ahead Friday by alerting my fellow puzzlers to all the joyous shenanigans afoot this weekend. The Baffledazzle Kickstarter wraps up this weekend, and Rachel has met her goal of $12,000, thanks in part to the marvelous puzzlers in the PuzzleNation readership! Congratulations, Rachel! I can’t wait to see the final tally and the gorgeous puzzles you’ll be producing soon! Plus, the Kentucky Derby returns today — if you couldn’t tell from our Wordplay Wednesday post — AND this Saturday is Free Comic Book Day! Check out participating comic book shops near you for more details! As if that wasn’t enough, Sunday is Star Wars Day! (May the Fourth Be With You!) We’ll be doing some Star Wars Day picture posting across our Twitter, Tumblr, Pinterest, and Facebook accounts for the occasion, so keep your eyes peeled! Finally, for the block-happy puzzlers out there, there’s the Sunday night premiere of The Simpsons’ LEGO Spectacular, an episode dedicated to everyone’s favorite building toy! So much for puzzle lovers to enjoy this weekend! Dangerous and disturbing this puzzle is. I couldn’t resist, it’s the only line in all six Star Wars movies that uses the word “puzzle,” and it’s a Yoda quote to boot! Greetings, my fellow puzzlers! It’s Star Wars Day, and we here at PuzzleNation simply had to join in the festivities, so we’ve got two Star Wars themed puzzles for your enjoyment! The first is a standard cryptogram of one of the series’ most famous quotations. This should be an easy one for crypto-fans and Star Wars devotees alike! UOKOXJH LOKCSZ, POJXW JUC PCB WOXEOT IP VJFGOX ZK FGO MHCKO QJXW. KCQ GO SOUW PCB FC GOHD GZI ZK GZW WFXBUUHO JUJZKWF FGO OIDZXO. Z XOUXOF FGJF Z JI BKJSHO FC MCKEOP IP VJFGOX’W XORBOWF FC PCB ZK DOXWCK, SBF IP WGZD GJW VJHHOK BKTOX JFFJML, JKT Z’I JVXJZT IP IZWWZCK FC SXZKU PCB FC JHTOXJJK GJW VJZHOT. Z GJEO DHJMOT ZKVCXIJFZCK EZFJH FC FGO WBXEZEJH CV FGO XOSOHHZCK ZKFC FGO IOICXP WPWFOIW CV FGZW X2 BKZF. IP VJFGOX QZHH LKCQ GCQ FC XOFXZOEO ZF. PCB IBWF WOO FGZW TXCZT WJVOHP TOHZEOXOT FC GZI CK JHTOXJJK. FGZW ZW CBX ICWF TOWDOXJFO GCBX. GOHD IO, CSZ-QJK LOKCSZ. PCB’XO IP CKHP GCDO. 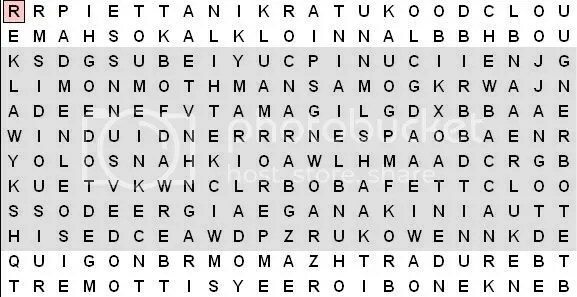 And the second is a Word Seek featuring characters from all six films (plus Ahsoka from the Clone Wars TV show). The entries in all caps are hidden within the grid, and once you’ve found them all, you’ll reveal a concealed message spelled out by the remaining letters! Good luck, and May the Fourth Be With You, puzzle Jedi!